Dominic and Felix Roco: Who's The Good Boy And Who's The Bad Boy? Our January 2010 Online Hunk Felix Roco and his twin brother Dominic are no strangers to the big and small screens, having starred in several TV shows and movies over the years. But, it looks like the indie scene is where these ruggedly handsome hunks have found home. Felix enthralled audiences worldwide when he played the lead in Pepe Diokno's Engkwentro, which bagged the Horizons "Orizzonti" Prize for new trends in cinema and the Lion of the Future "Luigi de Laurentiis" Award for Best Debut Film at the 2009 Venice Film Festival. This year, twin bro Dominic makes his lead role debut as Gibson Bonifacio, a boy who stopped speaking as a child, in the indie favorite Ang Nawawala directed by Marie Jamora. Felix also co-stars as Gibson's deceased brother Jamie Bonifacio. 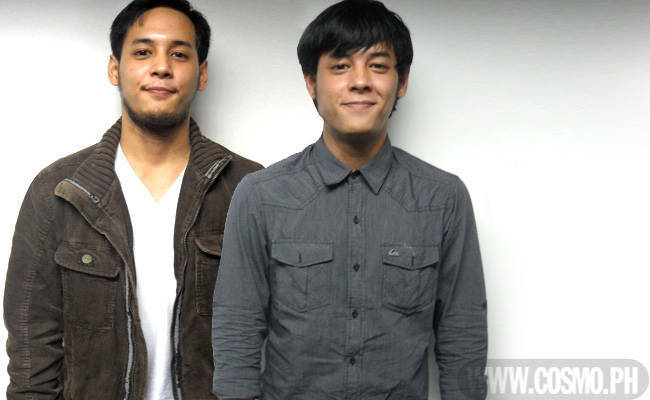 Ang Nawawala made a killing at the 2012 Cinemalaya Film Festival, bringing home the Audience Award and the Best Original Music Score Award in the New Breed category and earning a Best Film nod. As we revealed in our September movie roundup, the award-winning flick has gotten a cinematic release, and it hit theaters nationwide just yesterday! We caught up with the good-looking Roco boys at the Ang Nawawala press con, where they dished the pros of working together on camera, the type of girls that catch their eye, and the reason you Cosmo chicks should head to the theaters right this minute to catch these twin studs in action. How similar are you to your characters? Dom: I play Gibson Bonifacio. I can really relate to Gibson kasi I’m really shy in person. I rarely talk unless you talk to me first, so doon pa lang I can already relate to him. It’s not that I’m being snobbish; I’m just shy. Felix: I play Jamie Bonifacio. I didn’t have a hard time playing my character because [director] Marie [Jamora] allowed me to play myself so what you’ll see in the movie is the real me, the real Felix—the typical bad twin. Or ‘di naman bad twin, more like the black sheep. How was it like working together for the movie? Dom: At ‘yung chemistry. For me it is effortless working with Lex kasi I know how he feels and he knows how I feel, so we don’t really need ‘yung kapaan. Why do you think Cosmo girls will want to watch your film? Dom: Well, every girl loves a mysterious guy—or so I’ve heard. I can assure them that this movie is something they haven’t seen before here in the country. You have my word. It’s something new talaga. What type of girls do you guys like? Felix: Ako, simple lang talaga eh. Dom: Ako rin. ‘Yung hindi ma-makeup o makikay. As long as simple ka at madaling kausap. If you were at a party, what kind of girl would you approach? Dom: Honestly, I’ll wait for the girl to approach me. I won’t be the one to make the first move kasi shy talaga ako. Felix: If ever I do approach someone, it would be the one na tipong nakaupo lang. ‘Yung nag-o-observe lang din, because I’m more of an observer than a party person kasi talaga. What is your relationship status now? Dom: Single. I’m not really looking. I’d rather wait. I don’t want to rush things. Felix: Ako din. Single rin ako at nag-aabang lang. How similar or different are you from each other? Dom: Very different. He always goes out. Ako I just stay home. I’m a quiet person. Felix: I’m more of the outspoken type. So who’s the good boy and who's the bad boy? Dom: He’s the bad boy, I’m always the good boy. Felix: Pero good boy din ako deep down. Catch Ang Nawawala in selected cinemas nationwide until September 19! For the complete list of movie theaters, visit www.facebook.com/angnawawala.